Many teachers are faced with the hard task of teaching a really complex math concept to kids: fractions. Not only is it a hard concept to grasp, it is an essential building block for understanding algebra later on. To address this situation, Ululab’s team has created Slice Fractions, a new game developed in partnership with Educator Innovator partner Glasslab, to let kids freely explore the concept of fractions and let them overcome their fear of mathematics. 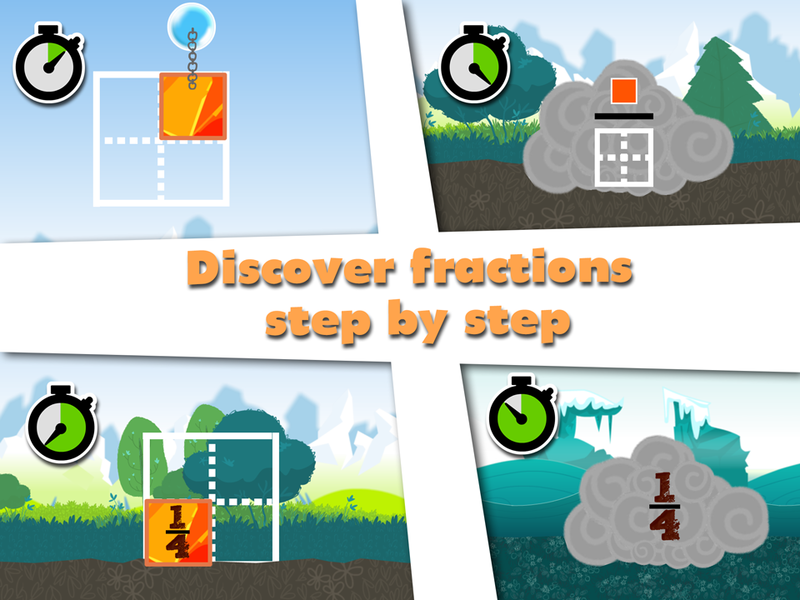 Slice Fractions’ gameplay was built specifically with fractions in mind, because we believe the game design should be driven by the learning concepts themselves. To do so, we brainstormed ways to represent fractions in a game and came up with good ideas using physic puzzles based on blocks of ice and lava. In the game, students learn by experimenting with fractions. Every time they slice a shape, it puts them in the proper mindset, enabling them to learn and understand how fractions of an object are divided. They must split shapes in equal parts, use the whole as a reference to compare the relative size of multiple shapes, etc. Each level is designed to identify and address difficult-to-understand math concepts and cause players to reconsider what they thought they knew about fractions. For instance, when students see ½ and ¼ for the first time, they may think that ½ is smaller because, after all, 2 < 4. When we designed the game, we also kept in mind that issues with literacy skills can get in the way of mathematics comprehension in schools. Word problems, or even lectures, can represent obstacles for children that are still learning to master language. Removing a need for literacy to comprehend math can thus democratize its accessibility and keep the kids focused on what we really want them to understand. That’s why, in Slice Fractions, we did our best to let students learn fractions without using any words whatsoever. Each concept is gradually introduced through sequences of levels that have no written instructions. This approach respects the student learning curve without undermining their engagement. To make sure players don’t get stuck, the hardest levels provide hints that remove a layer of complexity. These hints will pop up after a few failed attempts, and will help the player get through the level without completely giving away the answer. This approach and the game design have been validated with university education experts during the last two years. “The game encourages inductive reasoning in which students will extract important fraction concepts from the game as they progress through levels”, said Stephane Cyr, Professor at the Department of Mathematics, University of Quebec in Montreal. Moreover, early results from his experiment suggests there is a significant increase in conceptual understanding of fractions after playing the game. A larger scale experiment with control groups is ongoing for the 2014-2015 school year. A next step is to join GlassLab Games Services to accelerate and facilitate the adoption of Slice Fractions: School Edition in schools by adding new sets of great features such as: analytics, performance reports, classroom management tools and students login system. We at Ululab are honored to be part of the first cohort of developers in the new GlassLab Games Services platform. They share our commitment for polished and effective digital learning games based on the latest, scientifically validated teaching practices. We hope this collaboration will raise the bar in the world of educational gaming. Slice Fractions: School Edition is one of six high-quality, high-impact games made by leading game developers who are part of the GlassLab beta partner program. The awesome game, combined with real-time reports and instructional resources, comes to GlassLab Games in early February! Editor’s Note: François worked for major video game companies as a gameplay designer. He achieved a master’s degree in education in order to find the best way to use video games as an educational tool. He is in charge of R & D and design for Ululab.